To view the Complete Streets Request Form for this proposal, click here. To vote for this proposal on SeeClickFix, click here. In the early part of the 19th Century, Legion Avenue was known as the Milford Turnpike – extending westward from Howard Avenue towards the West River. East of Howard Avenue the street, simply known then as Creek Street, shifted to avoid the East Creek flowing in from the harbor. By 1830, however, small industries concentrated on tanning had begun to locate along the banks of the creek and the street’s name was changed to Morocco. Meanwhile, the Milford Turnpike was renamed Oak Street in reference to a grove of oak trees growing in what is now West River Memorial Park. As the 19th century progressed and industrial development along Morocco Street intensified, the creek was filled in 1875. In an effort to disassociate itself with this development pattern, however, by 1880 Morocco Street had adopted the name of its western counterpart, Oak Street. Extending from the Boulevard to Congress Avenue, Oak Street was a diverse corridor of shops, industries, and tenements at the center of several immigrant neighborhoods. The thriving marketplaces and streets, however, began to fade in the 20th century as commerce migrated to Washington and Congress Avenues. As a result of declining prospects for Oak Street, the western end was renamed Legion Avenue in 1927, but little substantive benefit came from the change. 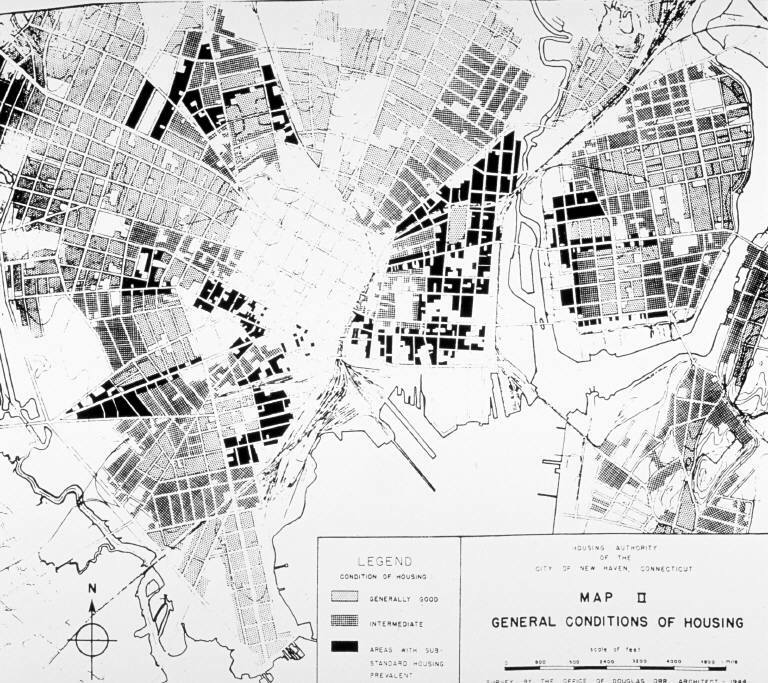 By the time of a 1944 survey of general housing conditions in the city, a large cluster of “substandard housing” around the current site of Career High School emerged. Clusters like this became the target of Redevelopment and highway programs in the 1950s and 60s. The Legion Avenue corridor was identified as the site for a highway connector between the I-91 and I-95 interchange and Route 34. In the late 60s, the State acquired parcels along the corridor for demolition. Due to numerous delays, however, the highway was never extended beyond York Street; only North Frontage Road was constructed to the Boulevard. In 2002 amid budgetary issues, the State transferred the land to the City of New Haven for use in economic development. Pfizer Pharmaceuticals constructed a building on the corridor in 2004, followed soon after by Lot E, 55 Park Street, 100 College Street, and most recently CenterPlan of Middletown has begun construction on a new headquarters for Continuum of Care across from Career High School. Legion Avenue east of Orchard Street exists as a three lane one-way road heading towards Downtown. The north side of the street is absent of sidewalks while much of the roadway is lined by parking lots and medical-related buildings. Virtually none of the old neighborhood remains in this section. Between Orchard Street and the Boulevard, Legion Avenue has maintained much of its residential character on the south side of the street while open fields and parking lots define the north side of the street. The roadway itself is two-lanes heading east bound and one parking lane adjacent to houses and apartments on the south side. Below I envision Legion Avenue as a residential street similar in character to Elm Street in the Dwight Neighborhood. For a more detailed description of how this proposal might work in the larger context of the entire corridor, see the article “A Call for a Hill-to-West River Community Plan” here. In this section of the roadway, one 10-foot travel lane and shoulders can be converted to a 7-foot parking lane and 5-foot bike lane. The Career High School parking lot could also be developed with ground floor retail with housing or offices above and parking behind the retail. On the north side of the street, a portion of CenterPlan’s parking lots might one day be replaced with a more intensive commercial or residential use along with wide sidewalks that incorporate the existing street trees. West of Orchard where a parking lane already exists, the travel lanes could be reduced in width to 10-feet, which would make room for a continuation of the bike lane. Development on the north side of the street would be most appropriate as medium density residential with single- and multi-family houses and apartments. From it’s earliest beginnings, the Legion Avenue has always been defined by an effort to improve its image. In the 19th century and 20th centuries, frequent name changes gave hope of a better tomorrow for the corridor. In the mid-20th century, the efforts of slum clearance and highway construction programs were seen as the path to improving Legion Avenue. Today, the city is pursuing economic development as the corridor’s redemption. A core part of any reimagining effort for Legion Avenue must include drastic improvements to the public infrastructure of the corridor. As it stands now, pedestrian and cycling facilities are wholly inadequate, largely because these facilities simply do not exist. New construction brings with it the opportunity to improve sidewalks and landscaping, but so far these upgrades have been concentrated along the north-south streets that traverse the corridor while infrastructure from Downtown to the West River has been absent. Recently, however, the City has been working on a West River Mobility Study that can be seen here. The report suggests locating a two-way protected cycle track along the north side of MLK Boulevard. Absent from the report are improvements for Legion Avenue, which, as I’ve outlined above, would be quite simple to implement.